The historical epic dates from the earliest days of cinema, with Intolerance and Ben-Hur setting not only the desired level of visual splendour (with budget to match) but also the preferred period. The recreated glories of ancient Rome and Egypt have dominated the genre ever since, although this obscures some notable explorations of other times and places. In each case, though, a convincing replication of the era’s architecture has been critical to bringing that world back to life. In the 1950s and 60s Hollywood studios turned to the genre as a potential saviour. 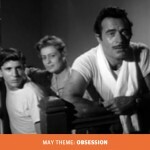 Shot on new widescreen formats and exhibited at luxurious venues, such films seemed ideal for luring audiences away from their televisions and back to the cinema. For his post-war Ben-Hur William Wyler, assistant director on the 1925 version, built Jerusalem at Italy’s Cinecittà complex. Streets, temples and buildings were realised, researched to a considerable degree of accuracy. 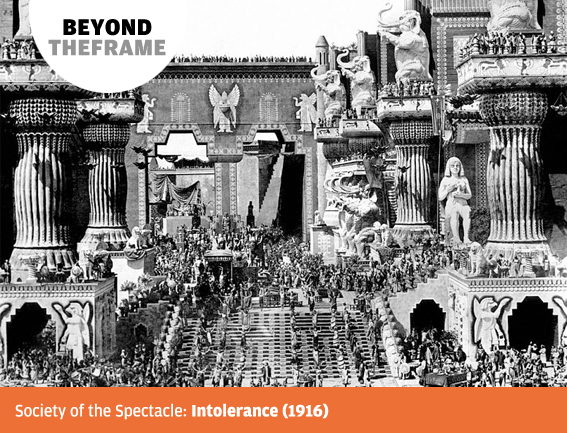 For the climactic chariot race a vast, life-sized Circus, complete with tiered seating and entrance gates tunnelled into a rocky backdrop, was erected. The massive bronze figures at each end of the central island appear wholly invented but have historical precedent in the Colossus of Nero. 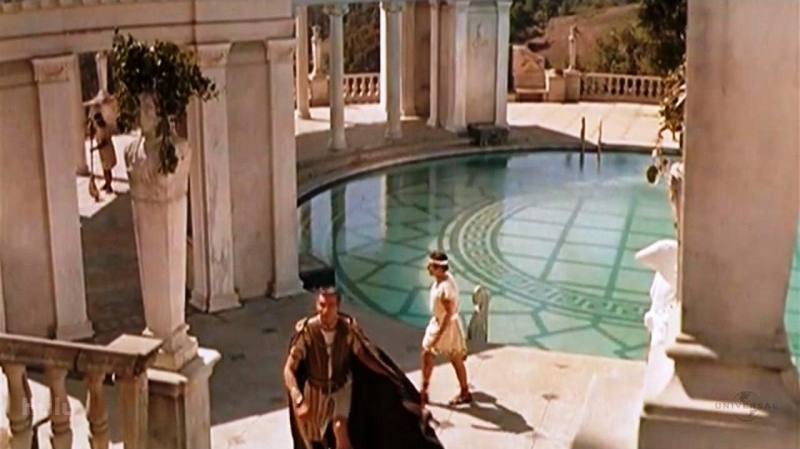 Kubrick’s Spartacus also used sets but, in an ingenious move, filmed exteriors of Crassus’s villa at the Neptune Pool of Hearst Castle, the extraordinary California estate built for newspaper magnate William Randolph Hearst, which incorporates an actual Roman temple façade in its construction. Producers’ cravings for ever-greater spectacle, echoing that of the emperors whose worlds they sought to copy, ultimately resulted in the bizarre excess of Cleopatra. Though retaining some linkage to recorded reality, the production design collapsed time and altered scale to concoct a kitsch display of gaudy colours and finishes more reminiscent of Flash Gordon. Those directors who chose alternative worlds to examine brought fresh vistas to the screen, though with the same resourcefulness. The burning of Civil War-era Atlanta for Gone with the Wind destroyed the sets from King Kong and other films. David Lean’s foray into Arabia was by way of Spain, using palaces and squares in Seville to represent Jerusalem and Cairo. Although Steven Spielberg’s Empire of the Sun bears that director’s stamp in its presentation of a young boy’s adventures in a world of adults, in the dramatic sweep of a city at war its origins as another project for Lean are clear. 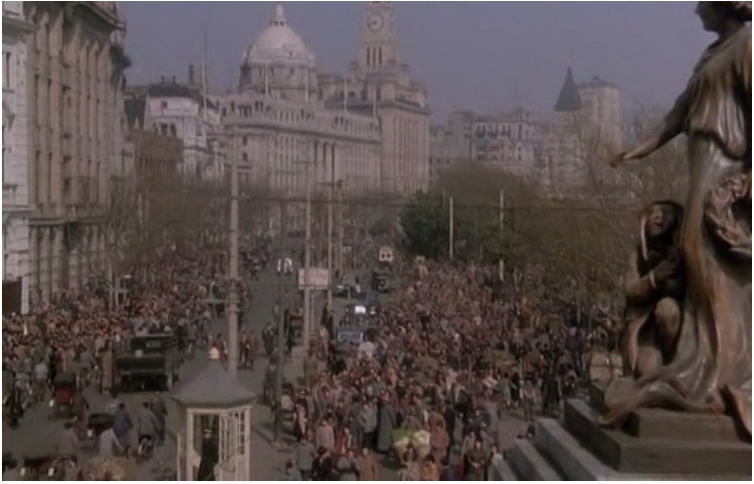 Set in Shanghai at the outbreak of the second world war, the film was actually shot there, notably on the Bund along the west bank of the Huangpu river. Its famous parade of headquarter buildings reflecting the power and confidence of the Colonial period is today dwarfed by the new towers of Pudong on the opposite bank. Spielberg filmed the more intimate International Settlement scenes in Richard Harding Watt’s eccentric Arts and Crafts houses set along the winding Legh Road in the Cheshire town of Knutsford, which epitomise the Edwardian idyll of a rural England. A new century saw ancient Rome visualised once more, in Ridley Scott’s Gladiator. 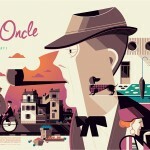 New technology allied with Scott’s predilection for visual richness brought a different approach, however. A gritty reality came from location shooting within the walls of Malta’s Napoleonic-era Fort Ricasoli, where sets were merged with actual stone architecture to create the street level Rome locations. Part of the lowest tier of the Colosseum was constructed full size but it was completed by ground-breaking digital imagery. Framing both were sets and additional computer-generated material to form Imperial panoramas that drew on Fascist iconography, including the propaganda films of Leni Riefenstahl. 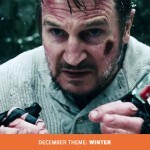 Despite this fillip, the historical epic is now as much a part of Hollywood’s past as the world’s. It does, though, have a remarkable postscript. For Cecil B. De Mille’s 1923 production of The Ten Commandments, avenues of Egyptian statues were built amidst the coastal dunes of Guadalupe, California. Too expensive to remove when filming was complete, the sets were bulldozed to prevent exploitation by rival studios. Sixty years later, an enterprising film-maker discovered the remains of sphinxes and bas reliefs in the ever-shifting sands and has spent the last quarter-century campaigning and occasionally digging to retrieve fragments of the wood and plaster forms. Thus a simulated past becomes an actual present, a built myth a concrete reality.